Low vision patients are described as people who have lost a significant portion of their vision. This may be due to pathology such as macular degeneration, glaucoma or diabetes. Low vision may also be the result of an injury or birth defect. This condition may interfere with daily activities such as reading, writing, watching T.V., or recognizing people’s faces. KC Eye Clinic offers Low Vision evaluations to determine how to maximize your vision. What can a low vision specialist do for you? A low vision eye exam is different than a standard eye exam. Instead of focusing on what your eyes “CAN’T” do, a low vision doctor concentrates on MAXIMIZING your remaining vision. Patients are taught to use low vision devices and techniques to compensate for their visual loss, which not only allows them to have more independence, but also enables them to enjoy hobbies that were once impossible because of low vision. Devices such as magnifiers, telescopes, and electronic systems can make a significant difference in a person’s quality of life. There are many non-optical devices that will be introduced to the patient such as large-print books and periodicals, writing guides, talking watches, and high quality reading lights, which often play a large role in the patients’ success. The first step in improving the quality of life for someone with limited eyesight is to be evaluated by a low vision specialist who can introduce them to all of the wonderful aids and resources designed to help those regain some independence. If you or someone you know would benefit from Kansas City Eye Clinic’s low vision services, please schedule a Low Vision Evaluation by calling 913.341.3100 or click here to schedule your appointment. What is available for patients with Low Vision? In addition to our medical devices, there are several devices and applications on the retail market that can help patients with vision loss. 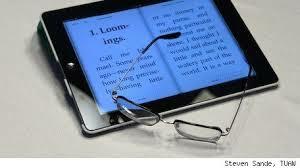 E-readers and iPads offer an alternative to hard copy and large print books. Spotlight Text is an iPad app developed by Howard Kaplan, MD. The app provides users with customizable font size, contrast, and dynamic presentation modes. The app works with Bookshare, a digital library with more than 300,000 titles for people with vision impairment. Additionally, the app integrates with Apple’s Voiceover feature, can be used with braille readers, and can be shown on an HDTV for extra-large text. To find out about the best apps for patients with low vision, read this guide provided by the American Academy of Ophthalmology.